Your beautiful patio awaits you! While slab concrete can create a functional patio, why not choose something personalized to your taste? A stamped concrete patio in Alexandria, VA is the perfect way to extend your living space and enjoy your landscaping. A stamped concrete patio is a solid slab of concrete with the surface stamped before it sets. We can stamp and stain your concrete to look like more expensive materials, including brick, tile, natural stone, and wood. A raised concrete patio in Alexandria is one of the latest and most exciting trends. 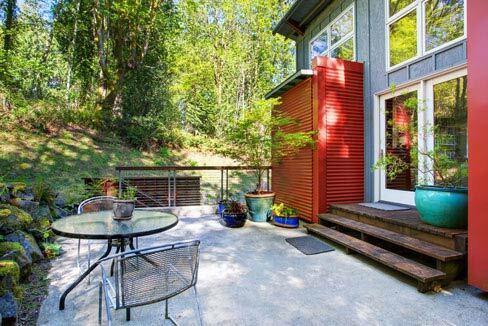 With a raised patio, you can enjoy an expanded living space that offers greater elevation, dimension, and lawn separation. 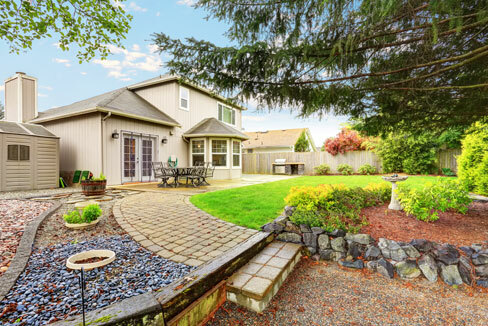 You will never need to worry about a rainstorm flooding your raised concrete patio overnight, plants creeping over the edges, or dirt getting kicked across the surface. For an even greater visual impact, we can even design a stamped raised concrete patio. Is your existing concrete patio too small for your needs? Maybe you have new patio furniture that doesn’t quite fit, or you’re ready to renovate your entire backyard. No matter the reason, our extended concrete patio service can give you the larger outdoor space you’re looking for. We can make an extended concrete patio or use pavers for greater visual interest. The beautiful concrete patio you deserve awaits you. Call today for a FREE estimate. A concrete patio doesn’t need to be cold and gray. We can use a variety of stains to add vibrant, rich colors to your slab or stamped concrete. There are two ways to stain an existing concrete patio: an acid-based or water-based stain. An acid stain works by reacting chemically with the concrete to create a warm, earthy tone. If you want a more vibrant color, a water-based stain is a better option. You have a greater range of options if you are having a new concrete patio installed as the color can be integrated into the entire slab. Concrete slab patios can be a great choice, but there are other ways to create a beautiful and long-lasting patio. Patio pavers are a popular option in Alexandria to create a custom, unique look. 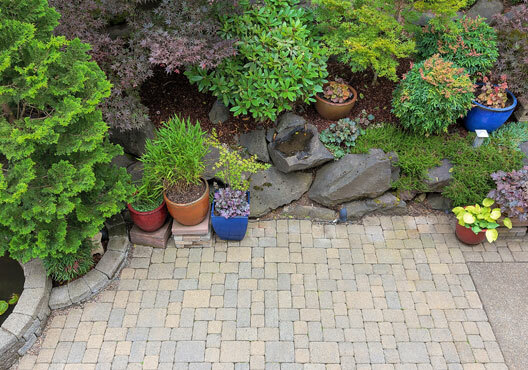 Pavers are a bit more expensive than poured concrete as they come with greater labor costs. Pavers are individual rectangular pieces of concrete or brick that are pieced together. An outdoor patio made from stone is a classic choice that never goes out of style. 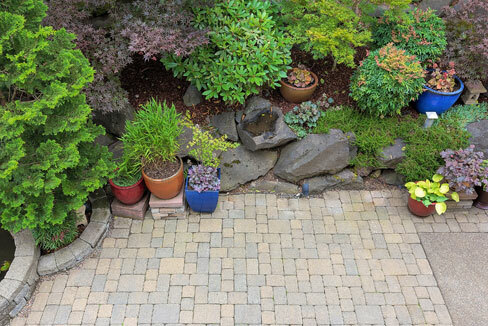 With natural stone, your patio will blend in well with your landscaping and look like it’s meant to be there. We install stone patios from many types of stone like travertine and flagstone. Stones come in an array of sizes and shapes so we can help you choose the style that will best achieve the look you’re going for. We have earned our reputation as a leading installer of stamped concrete patios in Alexandria, VA. High-Quality Materials. We use only the best materials to install paver and concrete patios in Alexandria. 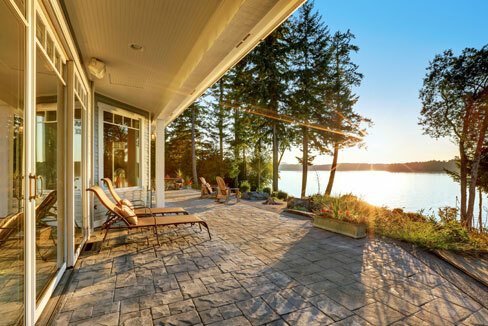 You don’t have to worry about your patio deteriorating after the first sign of bad weather. We believe in building beautiful patios that last. Affordable Pricing. Great quality doesn’t need to come with high prices. 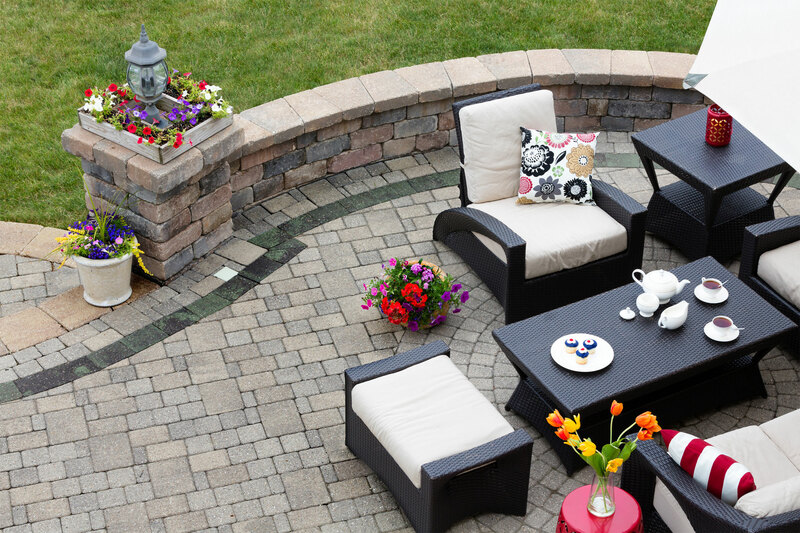 We believe in fair, honest pricing to help you afford the patio of your dreams. We will work with you to design a concrete patio that fits your style and budget. Top-Rated Company. We are one of the highest-rated concrete patio companies in Alexandria for a reason. Our customers know they can depend on us for reliable results, excellent customer service, and fair prices. Mention this at the time when you BOOK YOUR APPOINTMENT to receive this DISCOUNT! Questions about our patio services? Get answers to common questions below. If your question isn’t answered, or you want to learn more, please give us a call. A stamped concrete patio in Alexandria, VA has many benefits. We can achieve the same look as natural stone, brick, or even wood at a fraction of the cost. This makes stamped concrete an economical alternative to more expensive pavers. With stamped concrete, you can achieve a custom patio with limitless color and pattern options. Concrete can be stamped in almost any pattern and stained to mimic other materials. Stamped concrete also offers great longevity. 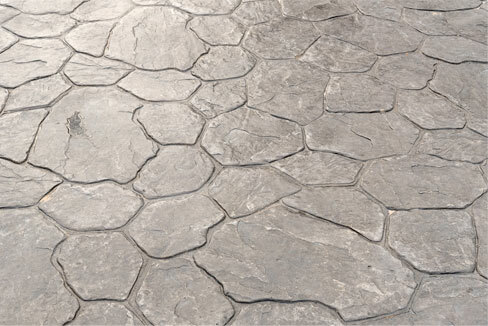 Your stamped concrete patio won’t sink at an uneven rate and it will hold up well to heavy use. It’s even fast to install. Because it’s installed as a slab of concrete, a stamped concrete patio in Alexandria is easier to install than pavers or natural stone. Concrete can and does crack over time. While there is no way to prevent concrete from cracking, professional installation of your concrete patio in Alexandria can minimize cracks. Most cracks can be controlled so they will be unnoticeable. The good news is stamped concrete is very durable and more resistant to cracking than other concrete projects. If your stamped concrete does experience minor cracking, the cracks will be hard to see and blend in with your joint lines and pattern. More noticeable cracks can be repaired in several ways. How do I hire the right contractor to install my concrete patio? Don’t trust your concrete patio project to just any contractor. The right concrete patio Virginia contractor can install your patio in a way that minimizes and hides cracking. Always choose licensed, insured contractors for your concrete project to ensure it’s built to modern code and you are protected if something goes wrong. The right concrete patio contractor should have years of experience performing concrete work with a portfolio or references showing quality work. You can also check their reputation by checking online reviews and looking for complaints with the Better Business Bureau. Price should not be your biggest concern. While you don’t want to overpay, choosing the cheapest contractor can also backfire. When you get an estimate, make sure you know what you are paying for and the expected quality of the work. Only hire a contractor that you feel comfortable with.